The following post is a transcript of an essay by Matthew Manos originally written in September, 2013 for GOOD Magazine. This text below represents the original “author’s cut” as it is unedited and is slightly longer than the version that was initially published. Since starting my freelance design career at the age of 16, I have been giving the majority my work away for free. In 2008, I decided to make that tendency a “thing” by launching verynice, a global design and innovation consultancy that gives over half of its work away for free to non-profit organizations. Over the course of 5 years, we have been able to actually perfect a business model that relies on substantial volunteerism and, as a result, we have been able to grow the business to be home to a volunteer staff of over 250 people in order to help hundreds of non-profit organizations across the globe save over $1 Million. By institutionalizing a 50% pro-bono commitment, giving back has become an integral component of our business, and now we want to help other freelancers, entrepreneurs, and small businesses do the same. Questions likely running through your head: when / why / how would you possibly do this? Why is it so important to give over 50% of your work away for free? Well, here are 6 reasons. Every year, in the United States alone, non-profit organizations will allocate close to 8 billion dollars toward marketing and design expenditures. It is at the core of our mission at verynice to allow organizations to re-invest those resources back into their cause in order to allow them to generate more impact. Can you imagine what could be done with a spare 8 billion dollars, per year? The possibilities are endless. Seeing giving back as a side-project cripples our chance to make change. Change only occurs when people start to focus. Giving back and volunteerism at large is often seen as an extracurricular activity that is initiated after work hours, maybe even during the weekend. If we want to get serious about making an impact, it is time to find news way to make volunteerism an integral component of our day-to-day lives and businesses. The question: “so what do you get out of this?” comes up frequently. Aside from good karma, giving a substantial amount of your time and resources to an organization or an individual can result in good business. By helping one another, you are able to form meaningful relationships – relationships are the basis of a successful career. Bill Gates and Warren Buffett have become the poster boys of philanthropy. This is great, but it has transformed giving back into this unobtainable act. The old model of business designs for the short term. The old model of wealth is to introduce philanthropy after the riches. The new model of business, however, designs for the long term. It designs for wealth and philanthropy to come simultaneously. When you are working on projects with absolutely no budgets to back them, you find ways to become very resourceful. This isn’t a new idea. Working under restrictions has long been the method of success for many artists, so why not use that to your advantage? More money, more problems? You are not that special. I often look myself in the mirror and wonder: “when did your skills become worth upwards of $200/ hour?” Professionals raise rates gradually over time as they gain more experience. It is a fact and an expectation. I would argue, though, that this rate inflation is not actually a result of an increase in value, but instead a genuine decrease in inspiration. As time goes on, we get tainted, and we need money as an incentive, but does it actually make us happier? That’s up to you to decide, but next time you look at yourself in the mirror, remember that you aren’t that special, and you aren’t too good to help someone out at low or no cost. Try it! 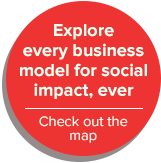 Social impact is on a treadmill. Not because innovation is weakening, but because things are far too expensive. Far too much of an organizational budget is being handed over to people that are just like me. Far too little of an organization’s budget is allocated toward making impact. If every business in the world gave half of their work away for free, we could allow humanity, and the progress toward actual change, to get off of that treadmill and run. Join me in a commitment to give half of your work away for free, and discover what that means to you.